Providing you the best range of projector screen with effective & timely delivery. 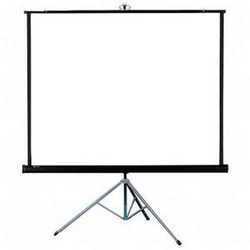 With our large distribution network we are trading quality assured spectrum of Projector Screen. These screens are tear resistant and wider in size. Extreme white these screens do not deteriorate the picture quality of clips running on projectors. Light in weight these are easy to hang on the wall. We are providing these screens to all our customers at very nominal price of the market.